That weve reached this dangerous place in the fight against police abuse was foreseeable, given the lack of any action by the political body politic to seriously redress racism among police. However, this avoidance of dealing with police racism isnt surprising. 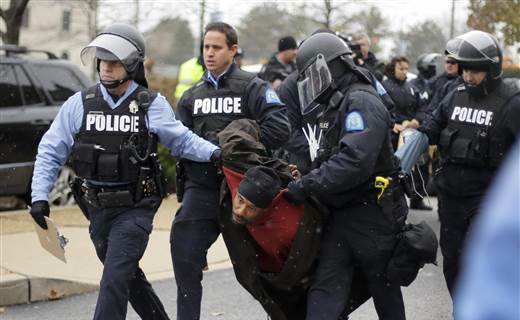 Americas political system created the evil of using police to control and destroy the lives of Blacks. Some are still pretending police violence against Black people is just a matter of a few bad apples. That lie was echoed in a recent debate by Republican presidential hopeful Wisconsin Governor Scott Walker. But that argument has been debunked by several things including: videos that continually show Black people being victimized by police; and the Justice Department report showing that Blacks, in Ferguson, were being singled out for exploitation to supplement municipal budgets, by the police and courts there. Urban police departments across the country are involved in similar schemes. Videotape and cellphone technology has been exposing the slimy underbelly of how police treat Black people. This is making it harder for White people to rationalize that there is, somehow, no difference between how Blacks and Whites are policed. The videos weve seen tell us we’ve only witnessing the tip of the iceberg. This state of affairs is radicalizing young Blacks in their stance against police, as politicians continue to twiddle their thumbs. Most of the body politic have not even uttered a solitary word, even in light of all the events that have happened in the last year. The longer politicians stay silent and fail to act, the more likely it is that a state of vigilantism will emerge. When politicians refuse to take action against serious societal problems, people inevitably take action into their own hands. America should also remember these words from President John Kennedy; “those who make peaceful revolution impossible make violent revolution inevitable.” Those denouncing violence by some protesters ignore the brutality peaceful protesters endure at hands of police. And since we have yet to see any serious indication the powers that be are invested in attending to the racist way police treat Black people then we can expect means more radical responses from young Black people. One example, is a group that emerged since the Ferguson protests echoing images from another time of conflict in America between police and Blacks is called the Huey Newton Gun Club. 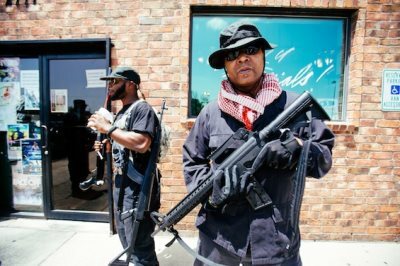 The Huey Newton Gun Club, which utilizes legal gun possession laws like the open carry statute, promotes the carrying of guns by Black people, to exercise their Second Amendment right, like many White Americans do. The groups advocates something the Black Panther Party, and others did: defense of Black people against the forces of oppression who operate inside the police force and within law enforcement. In the 60s, the Black Panther Party arose to defend the interests of Black people that were being ignored by the system. At the time, police, just like now, were often busy harassing and killing Black people. The response of the police with much help from J. Edgar Hoover’s FBI was to orchestrate frame-ups and assassinations, and to destroy this great organization for Black progress. Charismatic Panther leader Fred Hampton was murdered while he slept. Police attacked Panther headquarters nationwide, with the clear intent of destroying this movement being built to fight for the rights of Blacks. The Panthers and Black guerilla freedom groups were destroyed by the machinery of the American government. Within the current context, we’ve not seen the level of radical resistance that defined those fighting for Black liberation during the time of the Panthers. But with groups like the Huey P Newton Gun Club springing up, and the rage and sentiment that is on the streets, if these police killing continue, that may change. Blacks, especially the young, are faced with the daunting reality that their lives lack value in this society that has been against the interests and welfare of Black people since we were brought to the American plantations of hell. Some are now debating why we saw gun-play recently in Ferguson. But since weve been taught hate produces hate the answer should be obvious. And since America believes in settling issues by violence, why do some pretend this is so strange? Most Americans worship those who have helped Americans kill those deemed enemies of America. Former Black Panther Geronimo Pratt, a decorated Vietnam veteran with two Purple Hearts, two Bronze Stars and a Silver Star was praised for his military prowess in foreign wars. But when Pratt came home and decided to use his military knowledge to protect Blacks he was framed by the FBI and LAPD, for a murder authorities knew he didn’t commit, and was imprisoned for decades, neutralized, in the language of the FBI’s COINTELPRO, so he could not protect his people. Unfortunately, Blacks have also forgotten the legions of brave Blacks still languishing in jail, as political prisoners, because they dared fight for Black self-determination. America has no problem pinning medals on Black men when they are engaged in mass murder under the banner of the U.S. Army. The political hypocrites, who tell young Black people to be “non-violent” are often the same ones sending Black people to kill others in the foreign theaters of war; but expect them to meekly accept the violence police project on Blacks. This double-standard is unsustainable, especially when the extreme violence police mete out on Blacks is condoned and coddled by unprincipled political phonies. America is a nation not of peace, but of war. We are faced with the absurdity of a political class that constantly clamors for military intervention everywhere overseas, who promote violence as the ultimate form of conflict-resolution, while giving Black people grandstanding morality speeches. The pretense, that America’s government is basically a peaceful one, is undercut by the dark dossier of bloody deeds this nation is guilty of. America’s war machinery of death and destruction has been one of the main enemies of peace among mankind for decades. The savage treatment of Black people must be stopped. Black people have been backed into a corner. They will protect the lives of their children and people. 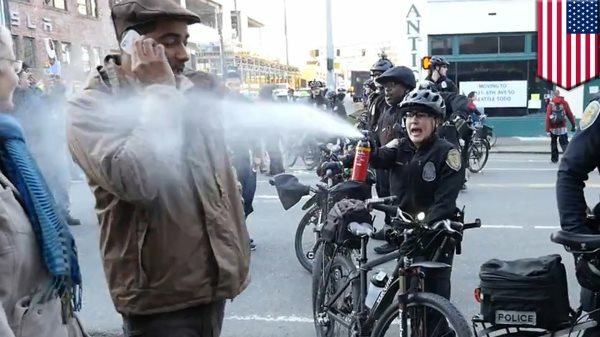 If the political elite refuse to do anything about the violence acts perpetrated by law enforcement soon no one will listen to those who still talk about peaceful means.